Saunders & Lingard - News- Spitfire Round Britain UPDATE ! Spitfire Round Britain UPDATE ! Did you see the Herald Express this week, and a picture of the vintage Triumph Spitfire that Rob Lingard owns? Well here is Rob`s latest update on the car, the lovely Blue one on the left, and it`s adventures so far in 2018. After a winter in hibernation, the "old boy" has been out and on the road since February and has had a number of good runs since then. 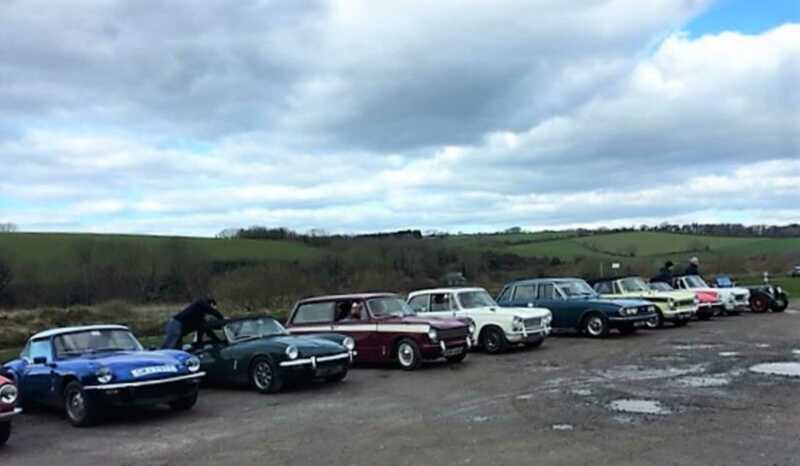 This included a wonderful day event which saw us join the local Triumph Sports Six Club event which ran from The Dart Bridge Inn, Buckfastleigh through the lanes of Teignbridge and the South Hams and out to the finish at The Tradesmans Arms, just outside Slapton Ley. Luckily this was just before the road was washed away in one of the recent storms. The car ran perfectly and I was joined by our 11 year son George who was the navigator and kept us on course! Now that the car is running fine it`s time to look at the next major work to be done on the car. This is an ‘engine out` assessment of the clutch, which hasn`t been right for a couple of years, and this will be done during April ready for the next run out in early May up to Bath. The goal is to have the car ready for the 2018 Club Triumph Round Britain Reliability Run in October which this year is raising money for Epilepsy UK. We will shortly be launching a Just Giving page as the main online portal for sponsorship and donations. We are also opening the car up for corporate sponsorship with your company logo on one of several ‘car panels` available so which this space as further details are rolled out in early April. In the meantime, if you have any questions or if you would like to put your name down to sponsor myself and the car in this wonderful yet challenging event, then please do call me on 01626 240229 for a chat!